925 Fleming Street This absolutely stunning two story home is in the most desirable location in historic Old Town Key West. 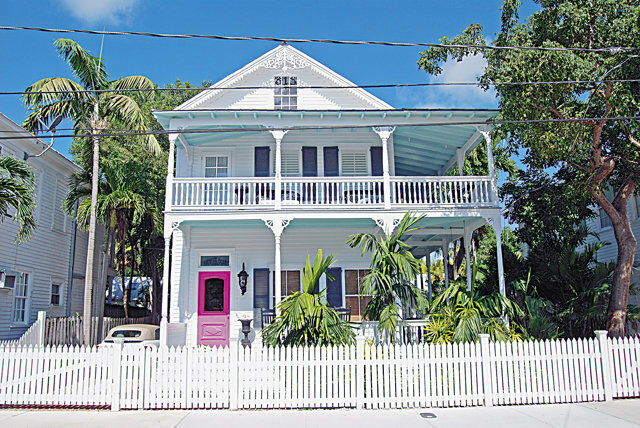 Classic Key West architecture defines this home with wrap around porches on both levels. Upon entering there is a gracious foyer with views all the way through to the rear of property. The main floor flows beautifully from the front living room to the formal dining room to the rear open kitchen and family room. Adjoining the kitchen is a separate room with service bar opening to the rear porch, pantry, laundry and half bath. Just off the half bath is an outdoor shower. There is an additional half bath off the entrance foyer. Upstairs are two generous sized guest bedrooms and a large guest bath. The new master suite has an entrance foyer, very large bedroom, gorgeous spa-like bath and enormous walk-in closet. Both levels have high ceilings, lots of windows, Dade pine walls and hard wood floors. Outdoors there is a nice covered rear porch opening onto the landscaped yard with pool and cute shed. In addition there is off street parking for two cars in tandem. This home has been completely renovated and shows beautifully.